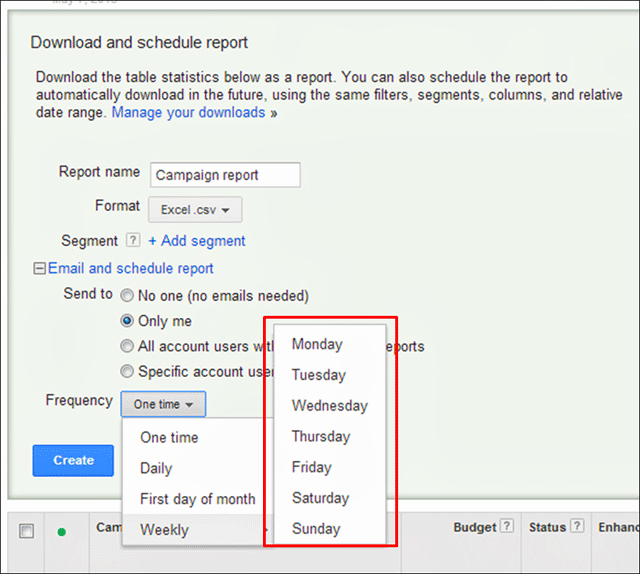 Google quietly announced on Google+ a change on how weekly scheduled AdWords reports can be emailed to you. Prior, when you scheduled your reports to be emailed to you on a weekly cycle, it would only arrive on Monday. Now, you have the option for that weekly email to arrive any day of the week. Yes, Sunday, Monday, Tuesday, Wednesday, Thursday, Friday and even Saturday - if you please. Starting today, you will have the option to schedule a weekly report to be sent to you on any day of the week that you choose. For example, if you have a meeting every Thursday to review performance for the preceding 30-days, you can have a report with data from the last 30 days automatically sent to you every Thursday (see screenshot with the new options below).